Multi-media learning handheld combining educational games, fun activities and e-books on a multi-functional touch-screen tablet. Develops core skills in reading, spelling, maths, logic and creativity with the many included activities such as an e-reader, video player and photo viewer. Parents can download additional games and learning apps from their computer (SD card required, not included) via the VTech Learning Lodge Navigator site. This toy costs approximately £49.99 (for the latest and best prices make sure you check our retailer list for the VTech InnoTab 2 Tablet Pink above). 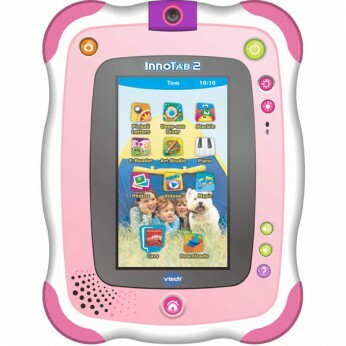 In our review of VTech InnoTab 2 Tablet Pink we classed it as being suitable for ages 3 years, 4 years, 5 years but recommend you check the manufacturer specific advice before purchasing.